Sorry for not posting any recipes last week, but I headed out of town again to Toronto. I hadn't been to this part of Canada before, so it was fun to see it. Toronto is an interesting city. But the food was the highlight of the trip. I actually am pretty impressed with myself, as most of the time I did eat paleo...until I found a cupcake shop. Ah well, nobody's perfect. The Shore Club was my first stop. 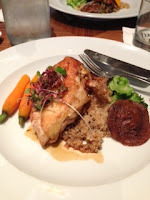 This swank restaurant was located right next to the Ritz Carlton in the Entertainment District of downtown Toronto. First up was the Amuse Bouche. 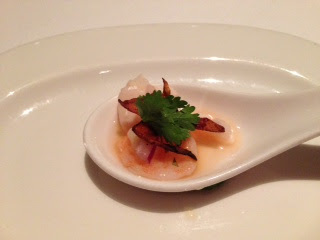 The chef sent out a ceviche of shrimp and scallops with citrus and cilantro. The mixture of the citrus and cilantro was delicious. You can never go wrong when you put citrus and cilantro together, as long as you are light handed with the cilantro. The little sprig was perfect for this bite size gift from the chef that promised good things to come. And did they ever. 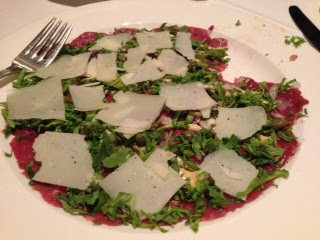 I opted for the Beef Tenderloin Carpaccio as my starter. Perfectly rare, thin slices of beef were topped with arugula, Parmesan and a tangy Dijon peppercorn glaze. The peppercorn was mild enough in the sauce to allow the peppery taste of the arugula shine in combination with the Parmesan. Quite possible that this was my favorite dish of the whole trip. The Grilled Marinated Mushrooms were another appetizer that I tried. A perfect combination of wild mushrooms was ensconced in a lovely lemon and fresh herb sauce. The mushrooms were cooked perfectly, seared with a caramelized exterior and a soft bite. And finally, the Lobster Bisque was quite good. Not the typical thick, creamy consistency that one may expect from a bisque, but the flavor was delicious, and the splash of sherry when served helped bring the flavors of the fish stock and spices together. There were only a few little bites of lobster, so that impacted what might have been. 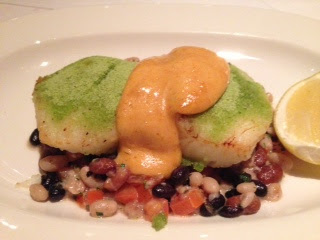 My main course was a Herb dusted Sea Bass with with Mixed Beans and an Ancho Chili Aoili. The sea bass, my favorite fish hands downs, was baked perfectly. Moist, but firm, this fish was perfectly season with salt and pepper. The herb crust was interesting. It didn't quite taste like herb, in fact, I could have sworn it was ground pistachio. It didn't work well with the other flavor combinations in this dish. Had it been a chive or tarragon crust, the dish would have been lovely. The aioli was spiced with the right amount of ancho chili and went well with the bean salsa. Dessert! 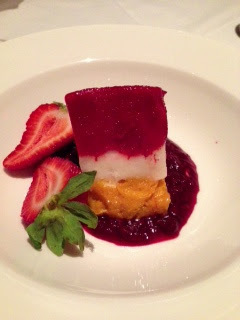 The Terrine of Sorbet was a wonderful way to finish this meal. Raspberry, Lime and Mango sorbet were on top of a raspberry puree. The flavors worked quite well together. The sorbet was smooth, tart and sweet. 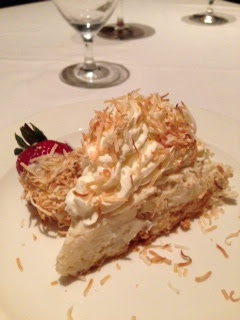 I also had a bite of a different take on Coconut Cream Pie. If you are expecting the overly sweet, fake coconut pudding filled pie, this is not for you. However, if you enjoy real coconut cream and freshly toasted coconut, then this one might be perfect. The filling was dense and surrounded by a layer of cake and topped with whip cream. I really can't expand on this dessert...it was simple and effective at imparting a delicate coconut flavor. My only thought is that it could have been a bit sweeter, but I did appreciate the difference in this pie compared to others. Cafe Crepe, near Chinatown, was my stop for breakfast the next morning. I think when it comes to crepe restaurants you really need to look for one offering a variety of fillings. Cafe Crepe specializes in Parisian style crepes, offering both sweet and savory. Of course I had to go with both! My savory crepe was a traditional Florentine (spinach, egg, Swiss cheese and tomato) with added Prosciutto. The fresh spinach and tomato made this wonderful. 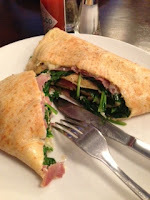 The crepe was thin and slightly crisp, allowing the ingredients to stay in the crepe without falling apart. The Prosciutto was a more like a ham than the traditional dry cured Italian variety that I am used to, but it was still good. My sweet crepe was a Dark Chocolate and Coconut, which would have worked quite well together had the coconut filling been a creme instead of shredded. The pieces of coconut didn't go well with the soft crepe and smooth chocolate. Lunch was at the Canyon Creek Restaurant. This little cozy downstairs restaurant was lovely. Dark woods and stone with local black and white photography adorning the walls made it simple but elegant. In downtown, this restaurantt is the perfect locale for a quick business lunch. My choice? 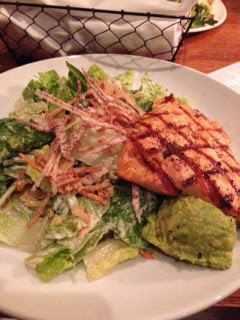 Grilled Salmon Salad. Let me first start by saying that anytime a waiter starts by saying that the Chef prefers the salmon to be medium knows what they are doing. One may think a salmon salad is simple and boring, but this variation is definitely neither. The salmon was cooked perfectly. 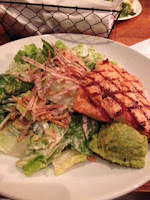 The char on the exterior was lightly done, thus not overtaking the flavor of the sweet and delicate salmon. The romaine was crisp and perfectly dressed with Miso Caesar. But what made this salad even more unique was the addition of pickled ginger, edamame, and wasabi guacamole. The bites of ginger combined with the dressing and guacamole made for the perfection combination of sweet and savory. Turf Lounge. This was a nice little restaurant/bar that draws the lucky crowd. Or, better said, those who prefer little games of chance. This seems to be an after work stop for those who want a drink, watch a game, and bet on a horse race of two. I didn't bet, but I told everyone to go with the pink, who happened to have the words odds. No one listened, and guess who one? Pink! I go by color. I do that for March Madness too and it serves me well. Anyway, the food was very good. I started with a Roasted Red Pepper Soup with Lemon Cream. This was not a traditional Roasted Red Pepper. It was a roasted dry red pepper mixed with a broth base. This made the soup pretty spicy, but the lemon cream helped, albeit lightly, take away the strong cayenne flavor. The main dish was a Roasted Chicken Breast with Porcini dusted Quinoa, Grilled Shitakes and a Citrus Jus. The bone in chicken had a seared, crisp and well seasoned skin and the meat was moist. The grilled shitakes really accented this dish quite well, and the quinoa was nicely cooked, without being too moist, and had a light mushroom flavor from being cooked in porcini broth. I really enjoyed the addition of the citrus jus in this dish. 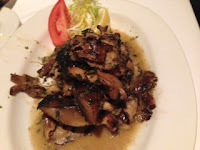 It lighted the earthly flavor of the mushrooms and accented the simple roasted root vegetables perfectly. My dessert choice was a Lemon Tart. I love, love, love lemon and am always on the hunt for the perfect lemon dish. This was high on my list. 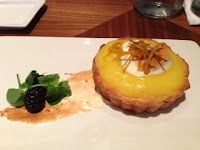 The tart lemon curd was smooth and creamy. It held well in the shortbread base. Very rarely do I find a lemon curd that is done well, but they nailed it.